Wow! What a difference 6 years can make. Based on the before and after images, which practice would you choose to be your new dentist? For us, it is simple. In fact, this is the #1 reason Dr. Moreno and Dr. Young have earned recognition for their new website. Your website is often the first impression you give to new patients. Does your website represent your practice? Tell your story? For them, it did not. They had been thinking about this for a couple of years. They knew their 2011 website did not accurately represent their practice. It looked old and outdated... with stock images and no compelling calls-to-action. The mobile version was even worse than the desktop – even though more than 50% of website visitors were now on mobile phones. In late 2017, they decided it was time for a change. They wanted something better... something that told their story and would help them convert more of their website visitors into new patients. Little did they know this design would also dramatically improve their search rankings and generate even more website visitors. Their new website went live in December 2017. During the 60 days prior to launch, they had no important search keywords in the Top 5 listings (and only one on page 1) of Google results for Bellingham, WA. Today, their new website has six #1 listings; 2 more keywords in the Top 5; and a total of 23 page 1 results. Interestingly, this has translated into a 63% increase in new patient conversions. 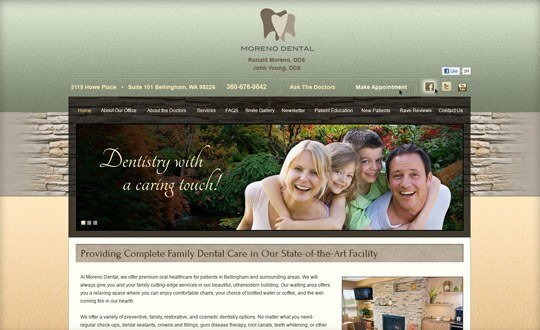 Moreno & Young Dental’s new website generated 62 phone calls and forms during January and February 2018 (compared with 38 conversions during November and December 2017). Everything started when the leader of TNT’s Video Production Team, Marcus Bellmore, boarded a flight to Seattle. By spending a day with Dr. Moreno, Dr. Young, their team and their patients, we were able to capture the content – images and video – to customize their story. Immediately, this gave us the opportunity to explore the spirit of the practice. More importantly, it enabled us to tell their story. The new website features a video introduction to the practice. 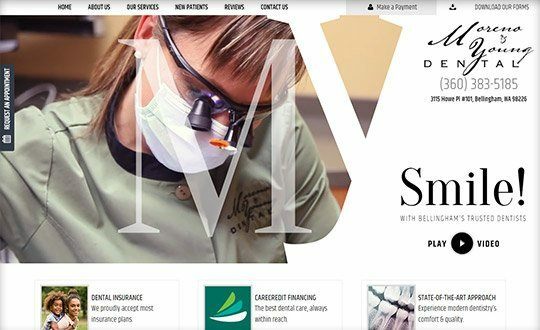 By featuring this on the opening screen of their homepage, they immediately differentiate themselves from every other dentist in the market. Now, they are cool and high-tech. And, they are the only dentist in Bellingham with video on the homepage of their website. Furthermore, we were able to feature patient stories – how they have helped others – via video and to provide personalized introductions to each doctor. Again, no other practice in their market does this. The new, open feel of the website creates a completely different first impression. The ever-present calls to action help engage and convert. Nowhere is this more evident than on the mobile version of the website where click-to-call, click-to-request and click-to-find buttons are locked into the “swipe zone” at the bottom of every screen... ready for the thumbs of prospective patients. In addition to the completely new look and feel, Dr. Moreno and Dr. Young have benefitted from an upgrade to the content and technological underpinnings of their website. For example, important information about how they work with dental insurance and their in-house dental savings plan is now easy to access. There is much deeper content on expanded services – such as sleep apnea treatment – throughout the website. 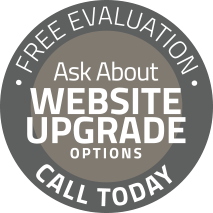 And, by redeveloping the entire website, we were able to help them earn industry-leading results on the Google Speed Test and to utilize newer technologies such as KMI files and schema code to improve its functionality. If you are having thoughts like Dr. Young and Dr. Moreno, please give Tim Kelley a call at (877) 868 – 4932. Today’s state-of-the-art, fully-custom websites cost around $200 per month. For most practices, this represents about 5% of their marketing budget. And, it is the best investment you can make. Even one new patient per month will generate a 10:1 return on investment.